The Creekwood Senior Fellowship is a gathering of members and friends of Creekwood Christian Church who are 55 and older. 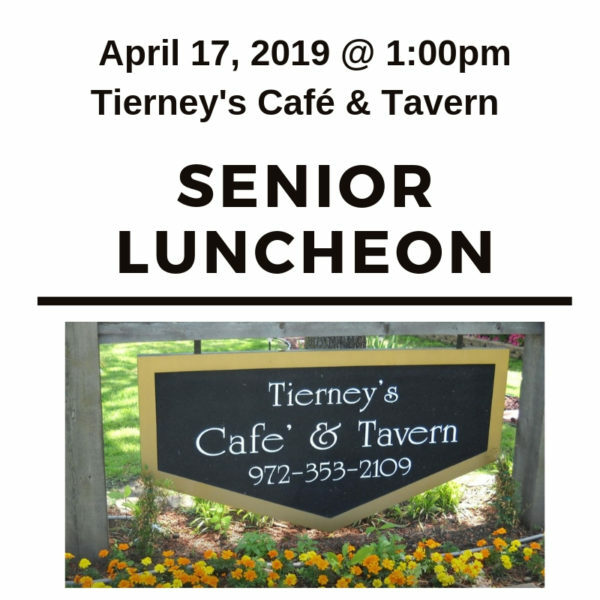 Come join us for our monthly Senior Luncheon on April 17 at 1:00pm at Tierney’s Café & Tavern located at 208 East Main Street, Lewisville, TX 75057. Please RSVP to Tom and Renda Goss, at TMG6909@gmail.com or 817-430-3410 our hosts to let them know you will be joining us. Visitors are always welcome.